Appearance: Vier is tall, somewhat gangly and wild in visage and nature. Standing at 5'9", she can sometimes cut an imposing figure among her female peers, however, it's the ferocity hidden within her gaze that draws the eye of bystanders. The kelvic's ravokian wolf nature bleeds into her features, with her uncharacteristically long canines, sharper than average nails and wild, dark mane that falls past her shoulders to her mid back. The length of her golden tan body is corded with muscles from a life of fighting tooth and nail with opponents in the KRI. Scars riddle her body from the clashes, others from punishments she'd received in her time among the captives. Many who see her might simply disregard the girl as unkempt, but beneath that veneer of fury and passion lies a predator's grace. Vier is wild, aggressive and decidedly untamed. Perhaps it is the ravokian wolf in her that refuses to allow the chains of slavery to bind her down and break her spirit, but it has gotten her through many of her trials and tribulations while in captivity. While unlearned, she is not unintelligent. 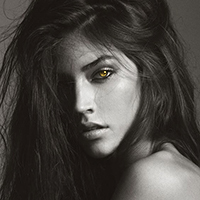 Curiosity still gleams behind her fierce yellow gaze, and she desires nothing more than to feel the grass beneath her feet as much as she craves blood on her tongue. Vier, while undisturbed by gross displays of carnage and abuse, does still feel some sense of loyalty, and even loneliness and despair, deep within her raised walls. Tell me all about your past, baby. House: A cell or probably a cage.